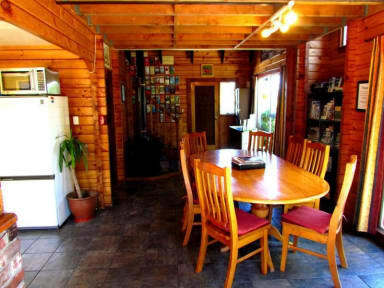 Hanmer Backpackers is the most centrally located hostel in beautiful Hanmer Springs. Our hostel is a small, cozy, friendly and warm Swiss chalet style backpackers providing excellent accommodation and service at low prices. We are the most affordable accommodation provider in Hanmer Springs for the independent traveller. The main attraction in Hanmer Springs are the Thermal Pools, which are located a 3-4 minute walk from our hostel! But there's more, Hanmer Springs is a fabulous place for mountain biking, hiking / tramping, skiing, rafting, bungy jumping, quad biking, golf, fishing, shopping and many more things. Our kitchen is well stocked with all the essential cooking equipment, fridges / freezers, free tea, plunger coffee, instant coffee, milk for the hot drinks and a complete spice rack. There is a nice outside patio with comfortable garden furniture and a gas BBQ and utensils. The lounge has some comfy sofas, extensive book exchange, board games, guitar and a massage chair to take care of you sore muscles after a day full of activities. Downstairs there is a big log burner that will keep the place cozy and warm, even in the winter. All beds come with bed linen, extra blankets, hot water bottles and are fully made up.